Peterborough United chairman Darragh MacAnthony insists he is excited by the prospect of Graham Westley managing his team. MacAnthony today (September 21) confirmed the Peterborough Telegraph’s weekend (September 20) revelation that the former Preston and Stevenage manager would succeed Dave Robertson in the ABAX Stadium hotseat. MacAnthony issued a statement to accompany Westley’s appoinment. He indicated a desire for Premier League football and a demand for an attractive and entertaining style of football. It read: ‘Today we welcome Graham Westley as the new manager of Peterborough United Football Club after what has been an extensive interview process with some excellent candidates. ‘I’ve spent the last 10 days getting to know Graham inside out and not only did we have a phenomenal one-on-one interview here in Florida, but we have spoken every day since Graham returned to the UK as I took my time making the final decision. ‘Before we ever spoke or met, I read all the various things written about Graham’s time at Preston, his apparent preference in style of football and his apparent obsession with fitness and physicality over style, flair and fast free-flowing football. To judge somebody on the views of others is something I’m never prepared to do without meeting and judging for myself. ‘I myself am often judged on some of the ludicrous nonsense written about me online or by people with agendas against me. Graham has a burning desire to win, to succeed and to add to his previous success which includes multiple promotions, league titles and multiple cup wins at Wembley not to mention a near 50% win record. ‘Graham Westley has achieved his success at what are so called unfashionable clubs and the one blip on his CV doesn’t mean that he should be blackballed and blacklisted from working in football or at Peterborough United. ‘Sure he has made mistakes as we all have at some point in our lives, sure upon reflection he would do things differently, but, remember, there are always two sides to every story. ‘Truth be known, I’m not interested in living in the past or obsessing about what our new manager did well or didn’t do well or how his teams did or did not play football. The objectives I have given Graham are simple; get our club back to the Championship, get our young talented squad playing to the maximum of their abilities with consistency, make them flourish and improve, but most importantly lead Grant McCann, the coaches and our young squad one step further then the Championship and do the impossible. ‘And finally let me state simply that I will never, as Chairman of this football club, sit back and watch what could be described as hoofball or direct and ugly uninspiring football. So understand that Graham Westley is clear on his objectives, what I want and the job that needs to be done at our club and quickly. ‘I am genuinely excited with this appointment and am looking forward to Graham showing our fans why I hired him above many others as our new manager. 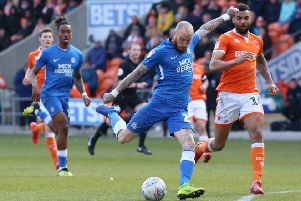 Posh have confirmed that former boss Robertson will not be returning to the club. He his engaged in talks with another club about an Academy director position.